Bringing together these two technologies with a single touchscreen user interface makes these combination systems optimal for all applications that require an effective brand protection program, and where floor space is at a premium. 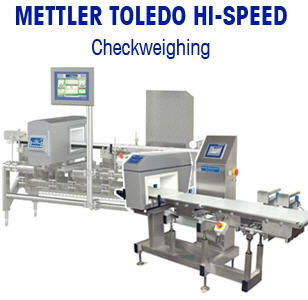 The checkweigher measures product weights quickly and precisely, rejecting "out of tolerance" products, while the metal detector reliably detects and rejects products contaminated by metal. Both systems are controlled from one central point. This simplifies and speeds up data entry, product changeovers, production quality documentation/statistics and operator training. The metal detector is available in a variety of aperture widths and heights, optimized for maximum detection sensitivity and protection of your products. Also available in a sanitary hygienic version for applications with a regular cleaning cycles, where intensive, high-pressure cleaning is required.